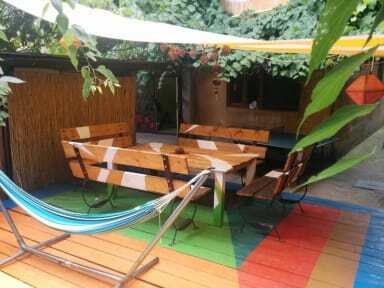 This cozy and friendly hostel is a one minute distance from the main square and close to all pubs/clubs/restaurants and supermarket. Our staff will tell you what to visit in the city and can plan your trip throughout Romania!! We will help you with anything, from renting a car to go on one of the most beautiful roads in the world, the Transfagarasean to finding an apartment if you are studying here and want to live in this beautiful city. We also take you on day trips around Timisoara with the car or by bikes so you get to experience the true nature of Romania! 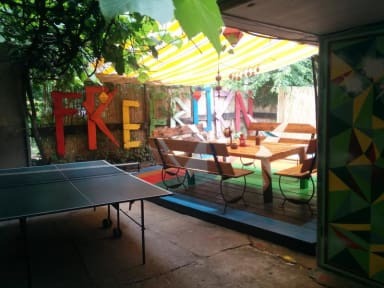 We have a beautiful courtyard where you can relax in the hammock or play ping pong, we also do grills, play poker sometimes, or just hang out and play the guitar. We are trying to make your stay as pleasant and as authentic as we can, and that's why we give you free shots of Palinca (traditional drink) made by our father!! In the winter we huddle up and stay inside, where we watch movies, play on the Nintendo Wii and drink some boiled wine! So no matter in which period you are coming, you will for sure have a great time! We accept payment in Euros, UK Pounds, US dollars, and of course, Romanian Lei.